Sometimes I wonder if Sundays have a similar effect on other people as they have on me. I've been here for 2 years now and my hypothesis is that Londoners couldn't care less about them: it’s just the second day of the weekend; hence let’s get up at 8AM and make the most of it, go for breakfast, go for brunch, munch... I have a hunch this is going to be a nice and productive Sunday. Ehhh... what happened to the so called psychological factor? Nothing, not a clue of it; Londoners are doers. I wish I could always look at Sunday in the eye and say: ‘You are nothing but the seventh day of the week, and you are a free day, so I don’t care if you feel grey and gloomy today... we are going out’. Well, sometimes I do it: this is the story of one of those Sundays. I learnt Manu Chao was playing in London out of the blue and as part of a charity festival in South London. I had never seen them live, so I thought this was a great chance to challenge the dying weekend and finish with some groove. I got to the Electric in Brixton at around 8; as usual, I thought I was arriving late, but this time I wasn't too concerned... even if they tried, Manu Chao would never start on time. My theory was confirmed when I saw a 200 meter static queue, .starting from the venue's door. Walking alongside it I started .looking at the people waiting to get in, and I was invaded by .the most beautiful nostalgic feeling: long curly hairs, untidy .beards, baggy trousers, ethnic rucksacks and rustic pullovers, .everything embedded in a strong human smell. It was like being back at home, a laid back atmosphere translated into clothing and hairdos, just like before a reggae gig in Niceto Club, back in Buenos Aires. When I got in I realised there were a few supporting acts (which I didn't know about, of course). I think I've expressed my opinion about supporting acts before. When you go to a restaurant, how many starters do you have? Either you have one, or you might share a few with other people, almost like a nice treat to warm up your belly, because you still want to save some space (end especially energy) for the main course. Well, they had 2 ‘starters’ that night, plus Manu later. Maybe a little too much. The first act was La Troba Kung Fu, a band from Barcelona. 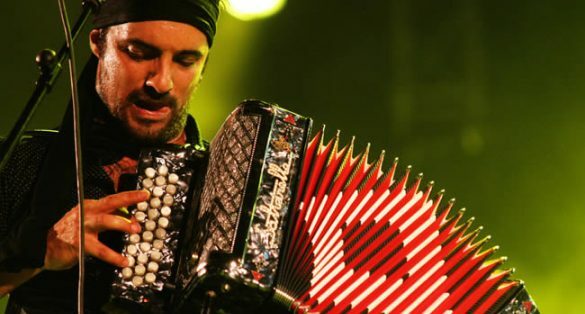 Led by Joan Garriega, accordionist and voice of the band, they play a mix of Spanish rumba, cumbia and bit of reggae and ska; certainly an interesting combination. But I think the best thing about these guys is that they were able to read an audience that was eager to forget about everything for an hour and let themselves go. We were all sitting in a happiness train, we only needed the driver to show up and start the engine. After the first tune, La Troba had the crowd jumping and cheering as if we were all watching our favourite band from all times. I'm pretty sure most of us didn't know who they were, but these great things happen when the passengers have the right vibe and the driver of the train knows what he’s doing. I'm not going to write too much about the second act because it was bad, definitely bad. The concept was all wrong: a selection of musicians alternating guitar playing and singing, over a DJ track. I mean, I'm sure they are all good artist separately, but together they produced one helluva mess. A complete turn off. Like thinking of your grandmother when you’re about to have your first kiss. After at least 50 painful minutes these guys decided to put an end to our misery. But it was too late. My spirit was trashed. The second starter had been a lead soufflé, with a thick engine oil coulis. Too much for my poor Sunday stomach. Manu appeared on stage shortly after that, and spent 5 minutes thanking the warmth of the people, touching his heart with both hands and putting his right fist in the air. You could tell he was a simple man, and was overwhelmed by the people's love. It was the first time I had seen him on stage, and I instantly liked him. Probably a great guy to share a summer barbecue with. The show was OK, but it was nothing like those unforgettable marathonic gigs I had heard so much about. I think it was mainly because he didn't have the full band with him (he played with a formation of only 4). And let’s face it, Manu Chao can be amazing, but without a good percussion section, a couple of brasses and maybe a violin, his songs could be a bit Spanish guitar monotone, with too many 3 chord tonic-fourth-fifth transitions. It wasn't bad; lovely people, great energy, but they didn't blow me away. Federico is a person who writes - no to be confused with a writer. He writes about what he feels, what he sees, and especially what he hears. His writing journey started with a short story about pirates when he was twenty years old (we could expand on that, but we’d rather not; pirates are so last season). However, before writing was music; that relationship had started long before, back in Buenos Aires in the late 80s, when his parents gave him as a present a tiny Yamaha keyboard that sounded more like a Nintendo console than an instrument. Music and writing came together for the first time in London. Federico moved from his hometown to the UK capital in 2010, where he started exploring the richest live music scene in the world. He currently writes a blog with short reviews and stories about gig experiences, plus a few other bits.